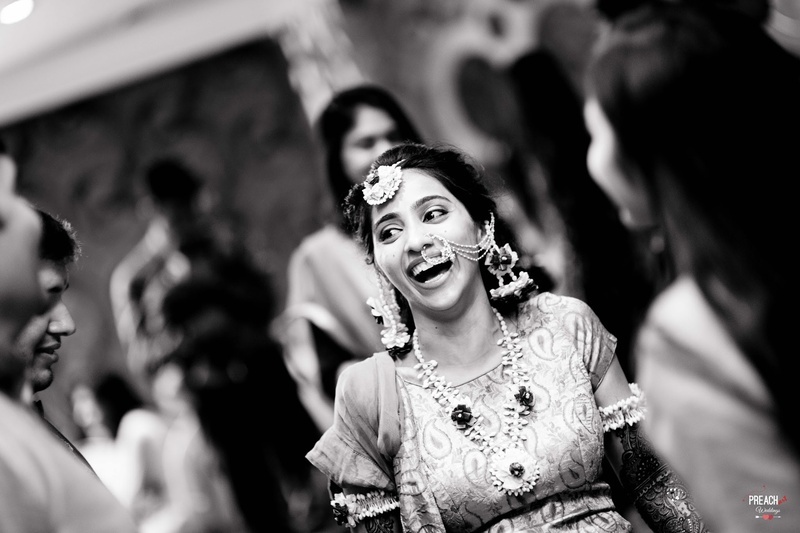 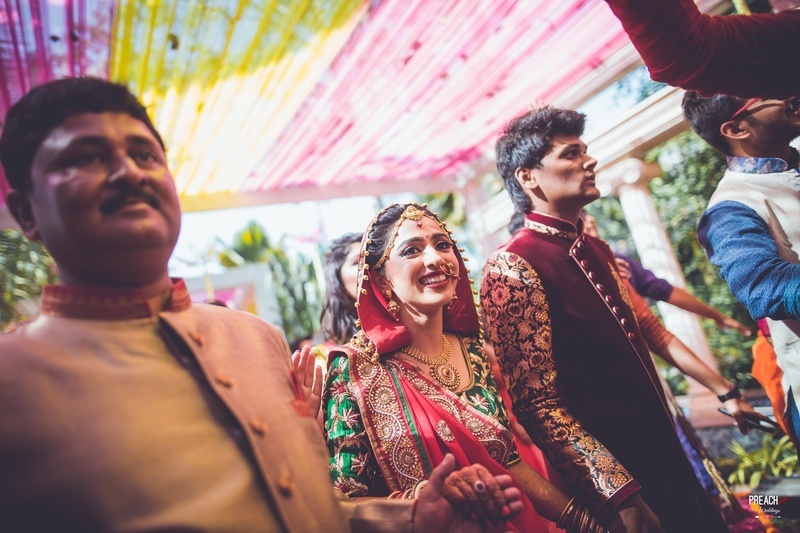 High School Couple's Big Fat Wedding at Mangalya Vatika, Sola Bhagwat, Ahmedabad! 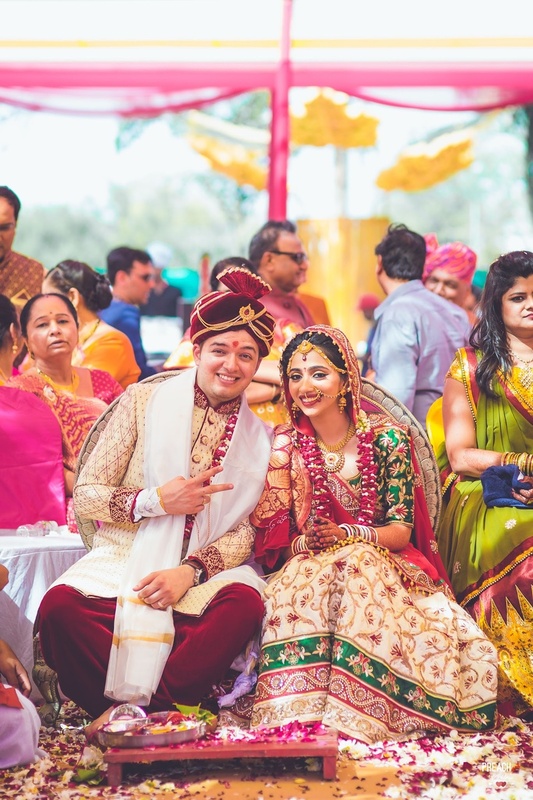 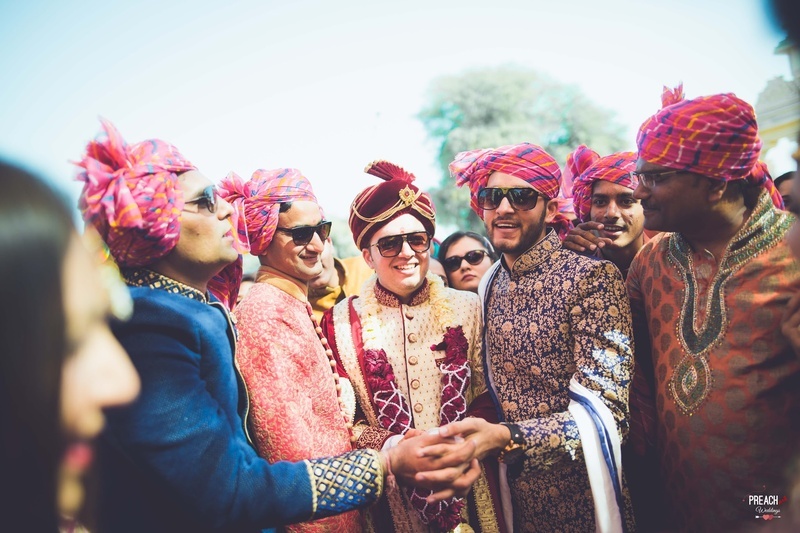 This ideal couple decided to make it official at Mangalya Vatika, Sola Bhagwat, Ahmedabad with all the pomp and splendour that an Indian wedding entails. 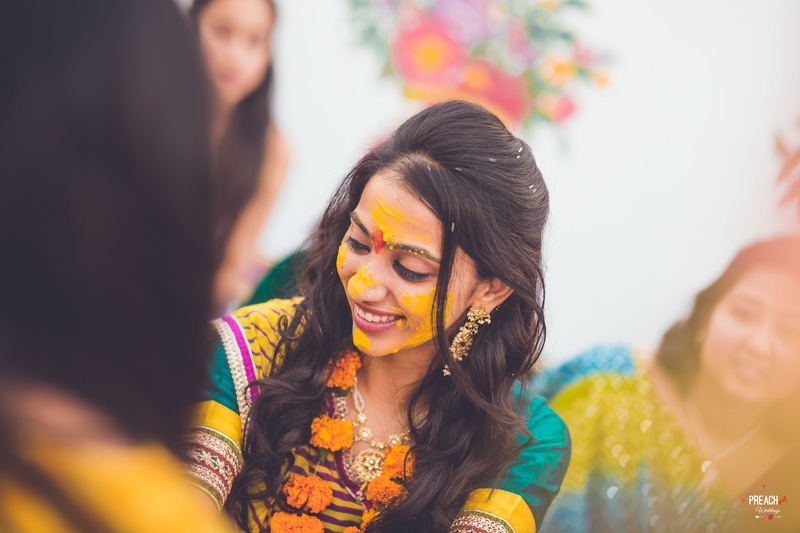 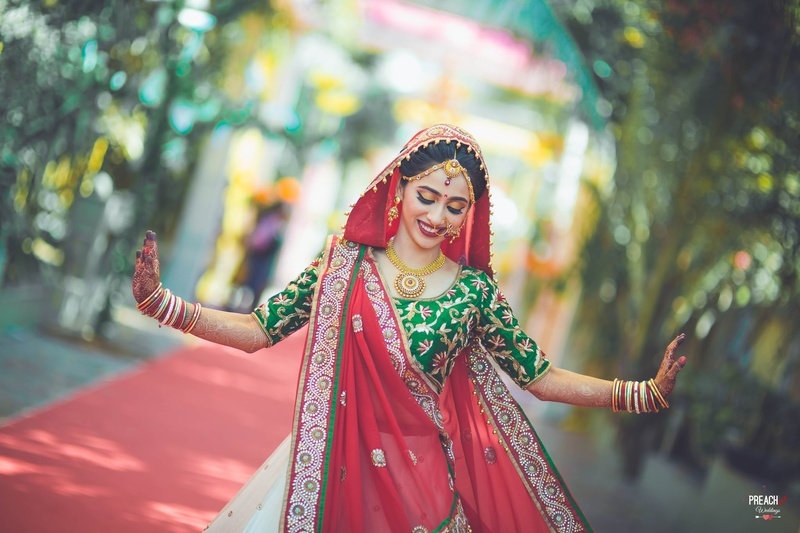 The festivities were kick-started with a ceremonial mehndi and haldi session followed was a fun-filled sangeet night where she stunned us all in an orange lehenga with gold work by J. Kamdar, Rajkot along with a beautiful statement passa. 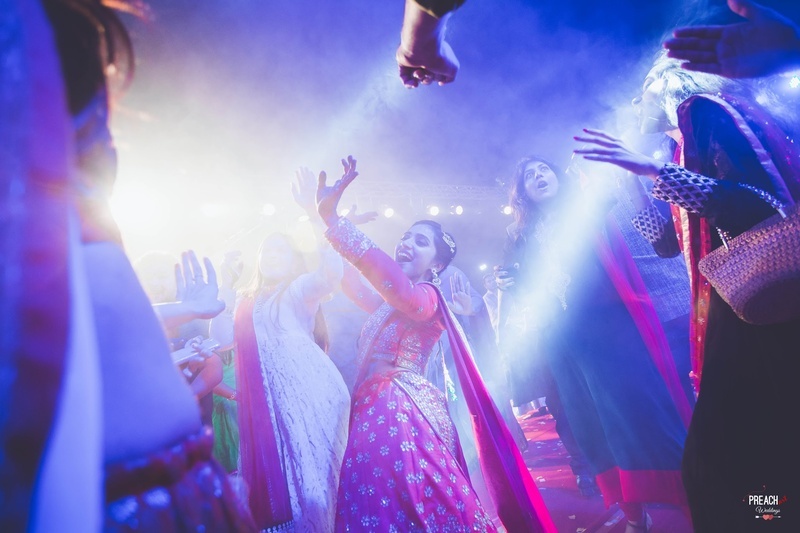 With all the glitz and glam we witnessed, thanks to the moments captured by the team at Preach Art, we’d say the event was certainly Bollywood-movie-worthy. 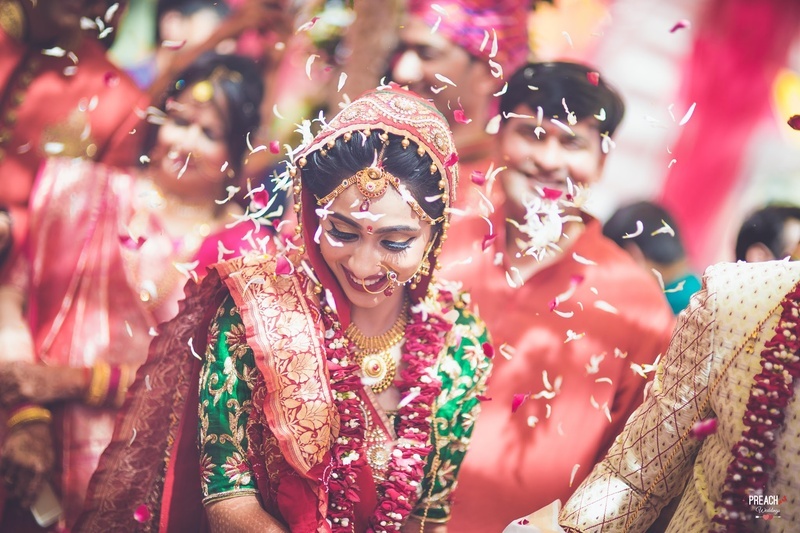 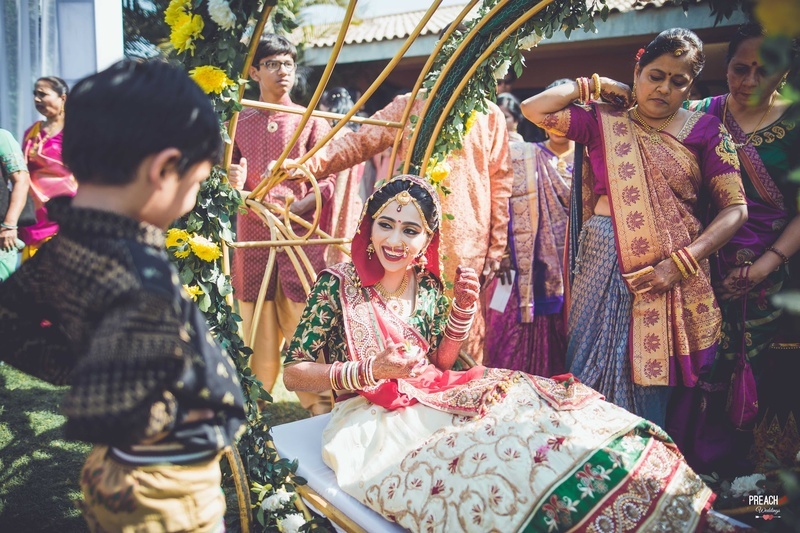 The wedding itself was no less splendid, with the bride and groom wearing colour co-ordinated outfits that complimented not only each other but also the wedding décor! 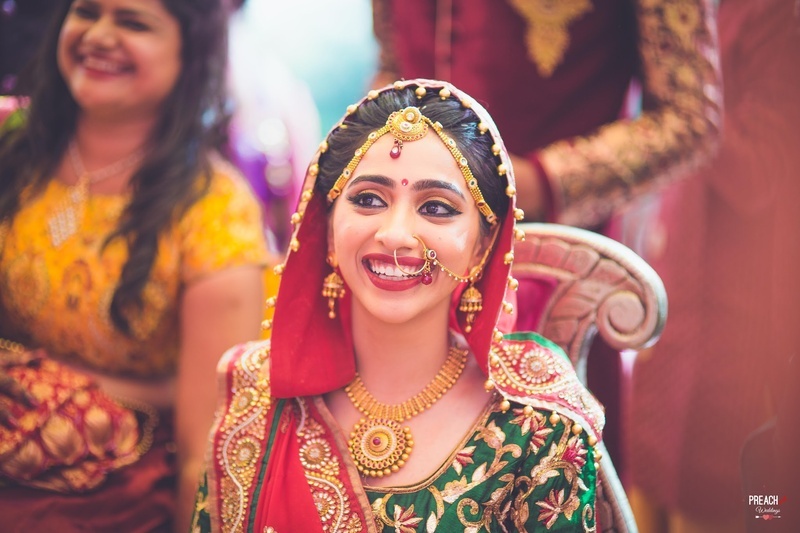 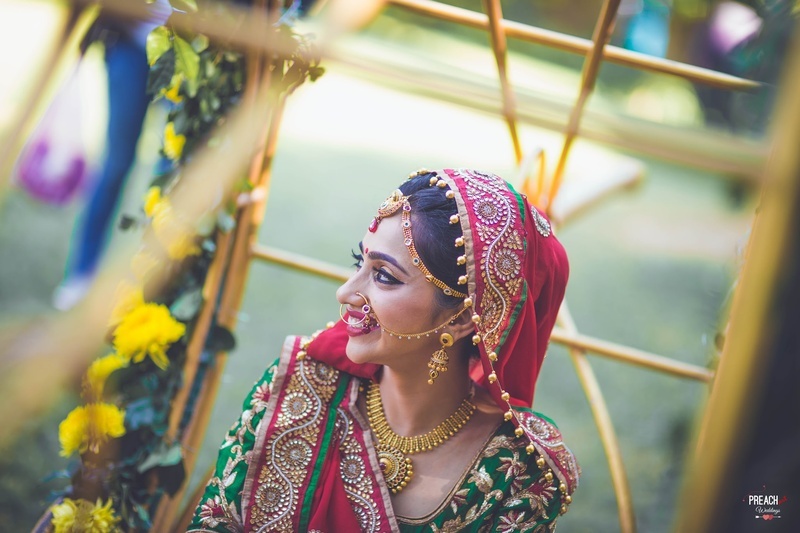 What to look out for: the beautiful, floral mandap decor, Krina’s cream, red and forest green lehenga with gold embellishments and the flawless make-up by Orange Salon that complimented her outfit more than perfectly. 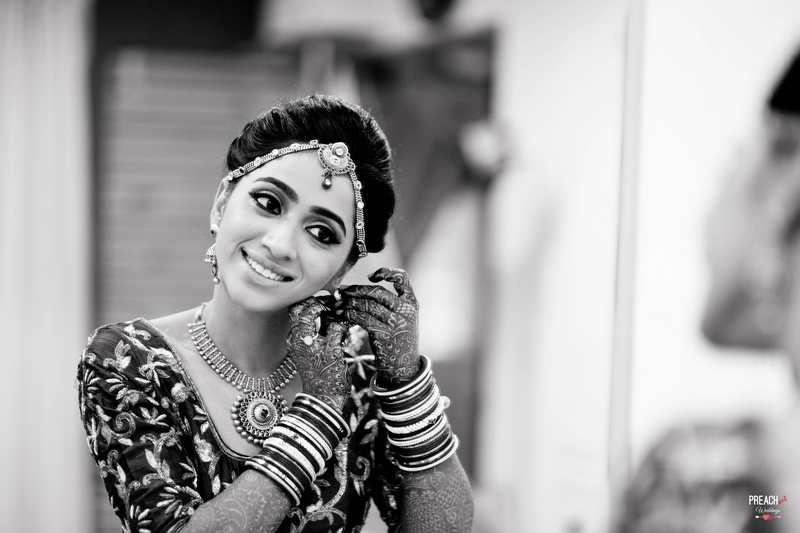 The Perfect One - Sahil & Krina Wedding Trailer from Preach Art on Vimeo. 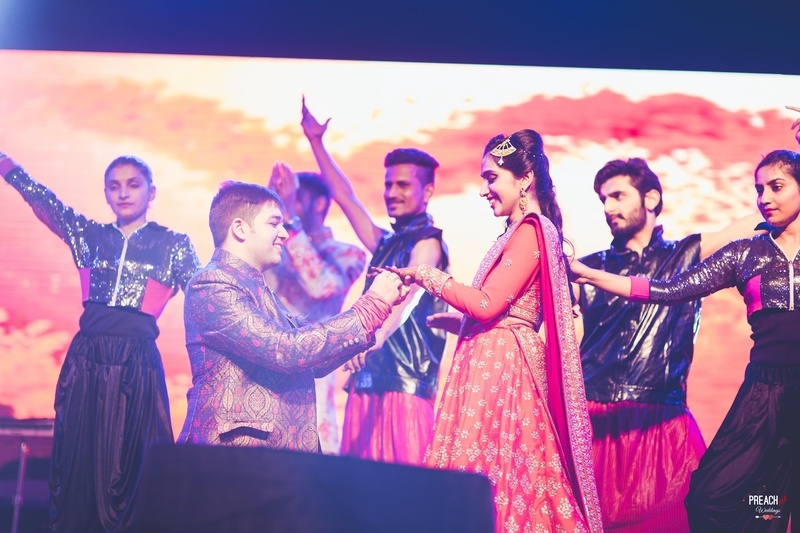 Mehendi Ceremony held at Kasba Hall, Alpha One mall, Ahmedabad. 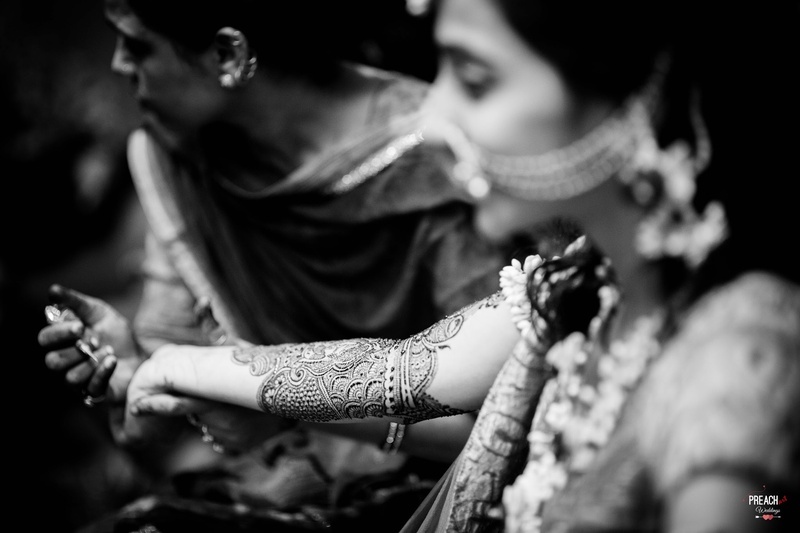 Bridal mehendi design by Shabana Mehndi Artist and group. 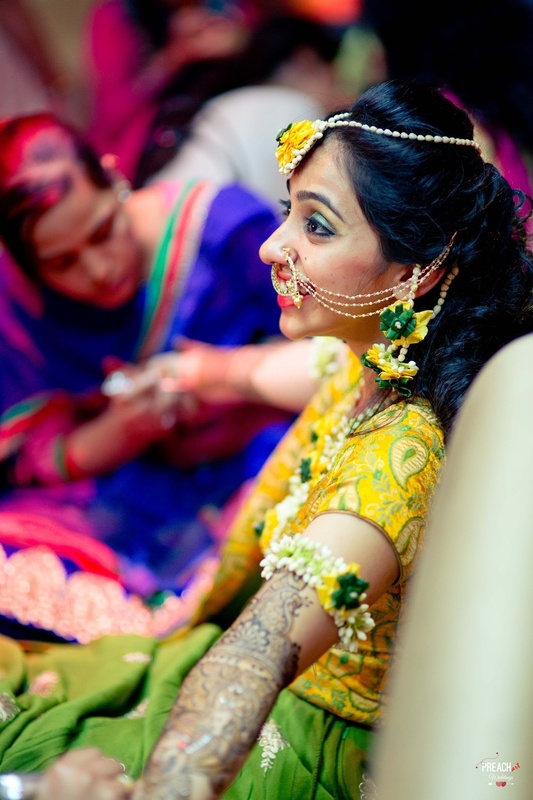 Wearing yellow and green brocade lehenga designed by Jay styled with floral jewellery for mehendi ceremony. 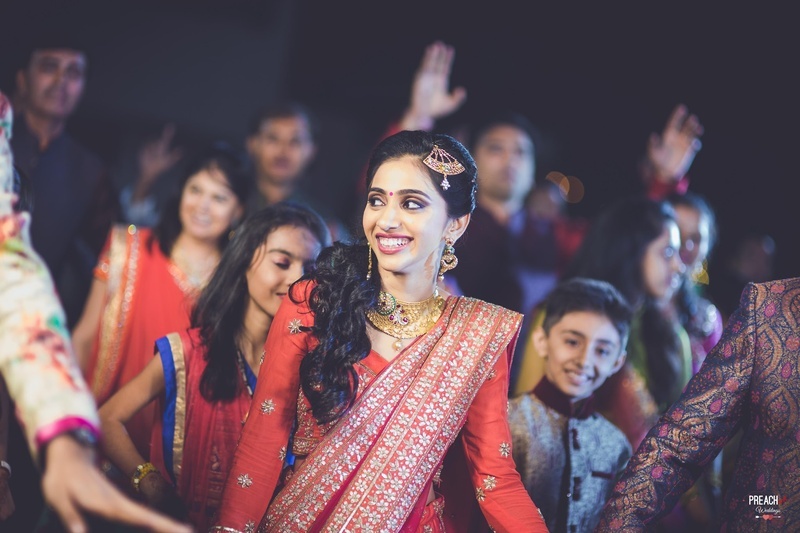 Wearing orange lehenga styled with gold neck piece and gold passa for the sangeet ceremony. 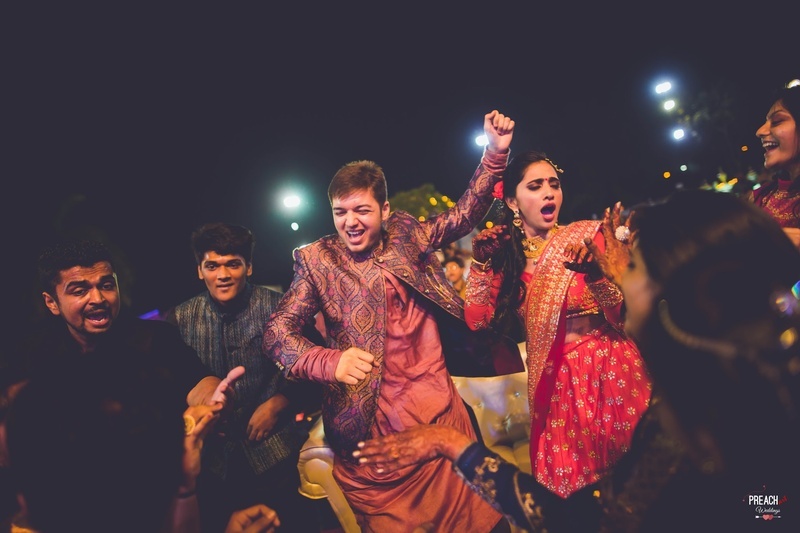 Sangeet ceremony held at Morli Farm, Near Sindhu Bhavan, Ahmedabad. 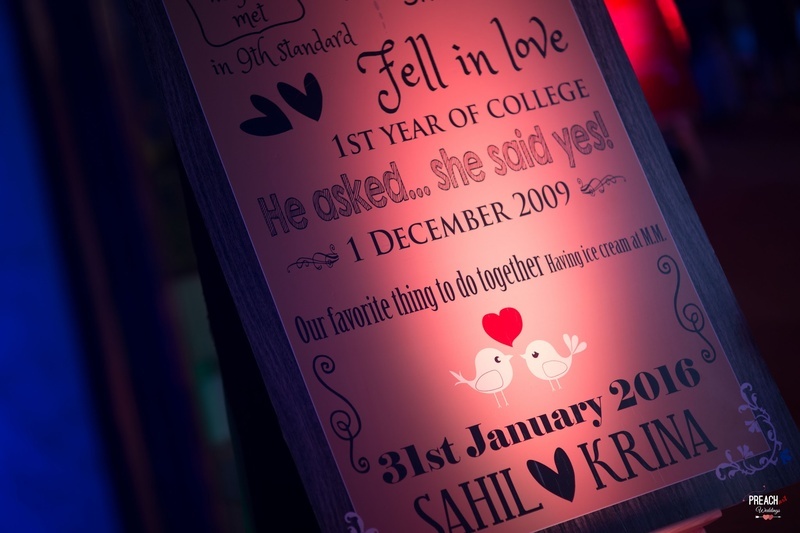 Cute signages at the sangeet ceremony . 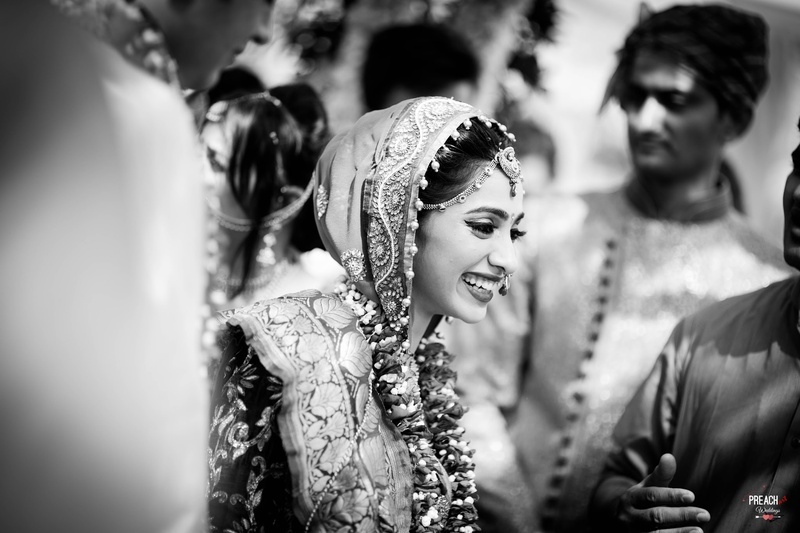 Black and white bridal photography by Preach art. 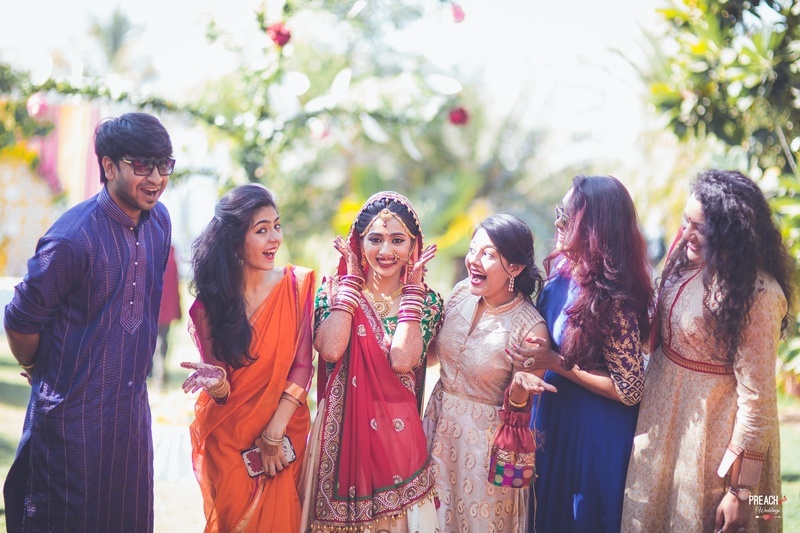 Bride and bridesmaids just before the wedding ceremony. 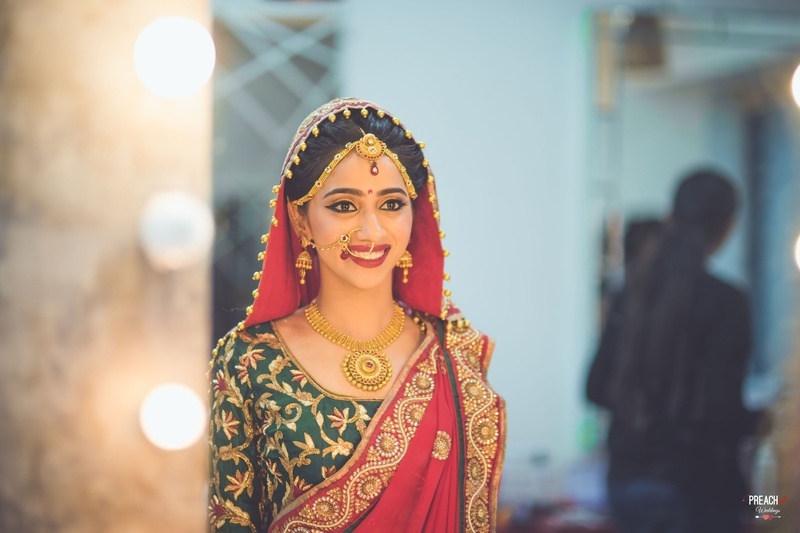 Wearing Gold bridal jewellery by Zinzuwadia Jewellers. 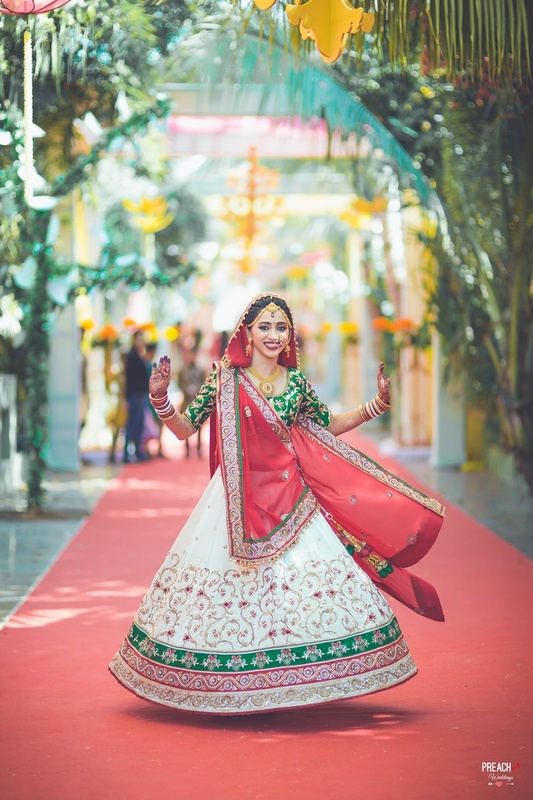 Wearing white red and green lehenga with intricate gold embroidery work styled with minimal gold jewellery. 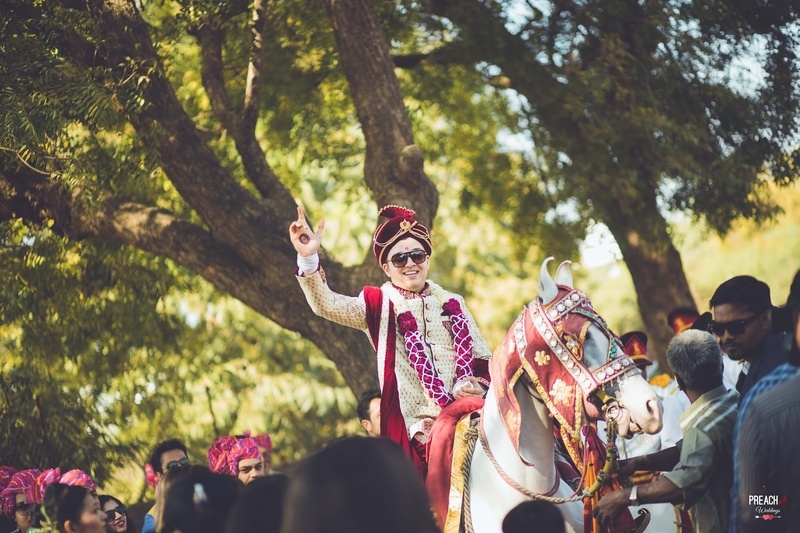 Entering the wedding venue in a big chariot beautifully decorated with flowers and leaves. 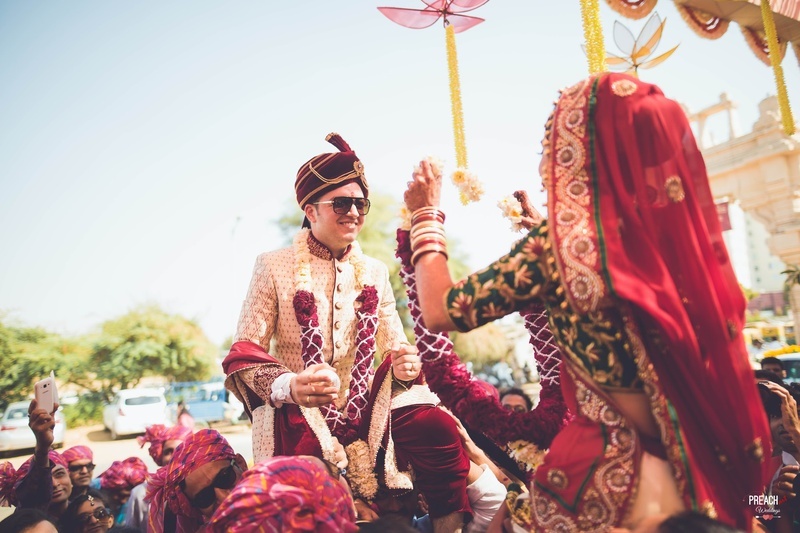 Baraatis entering the wedding venue ! 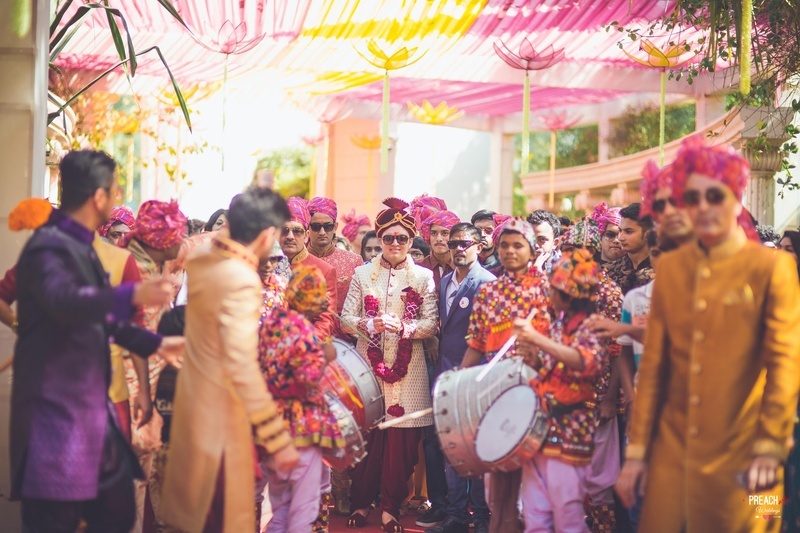 Baraatis entering the wedding venue with dhols and lots of fun elements! 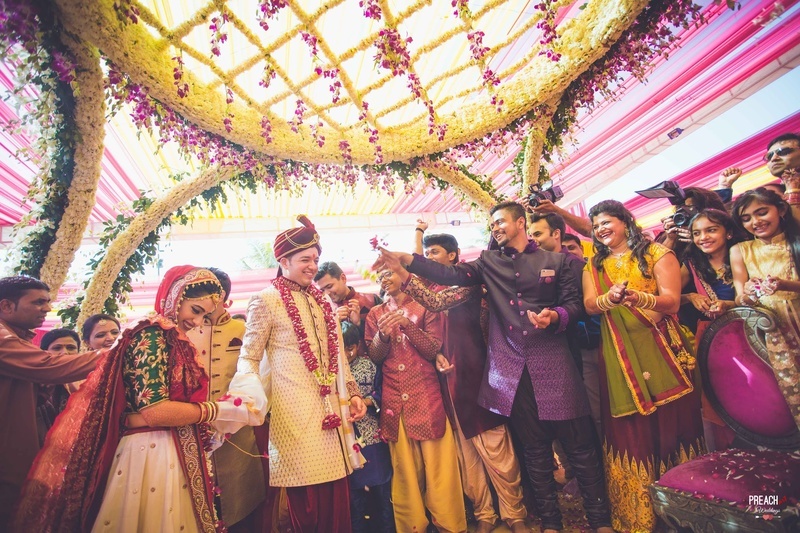 Groom Sahil looking dashing in this cream and maroon sherwani by Asopalav. 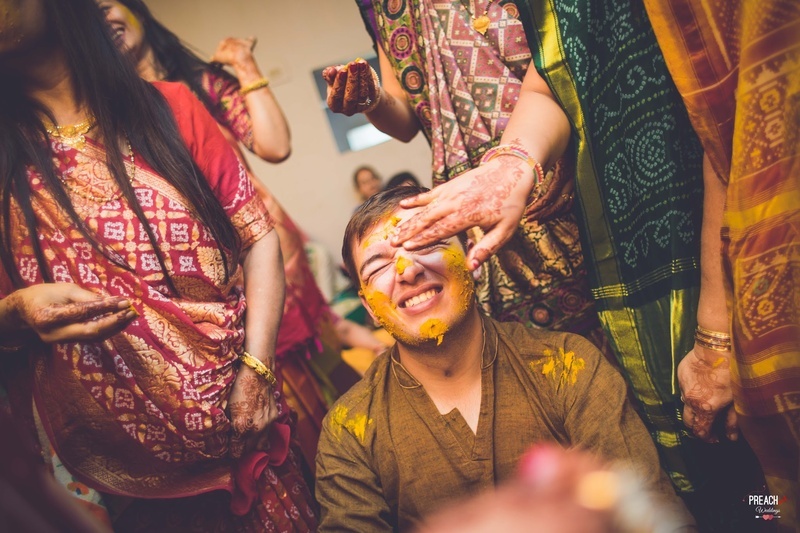 Varmala ceremony held at Mangalya Vatika, Sola Bhagwat, Ahmedabad. 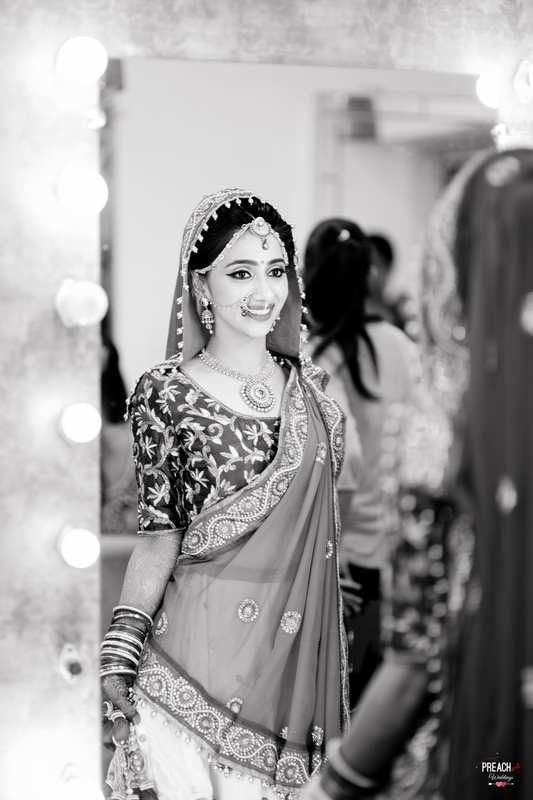 Bridal black and white photography by Preach Art. 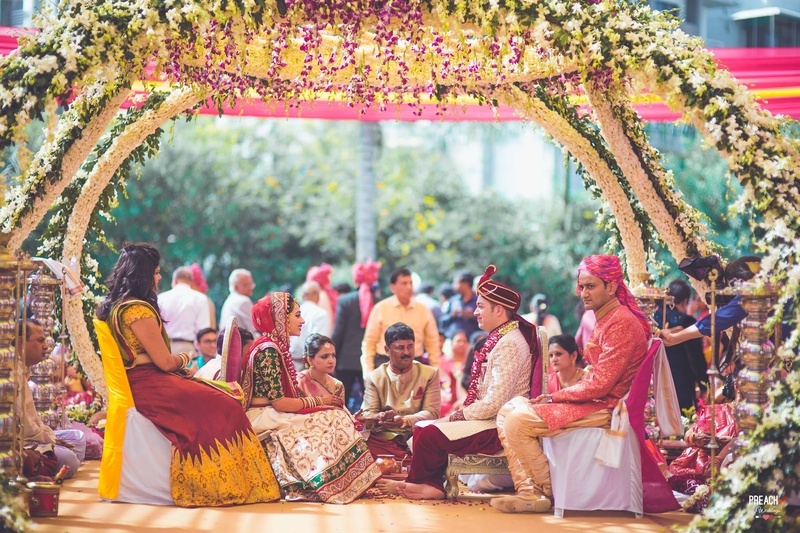 Mandap decorated beautifully with flowers and leaves. 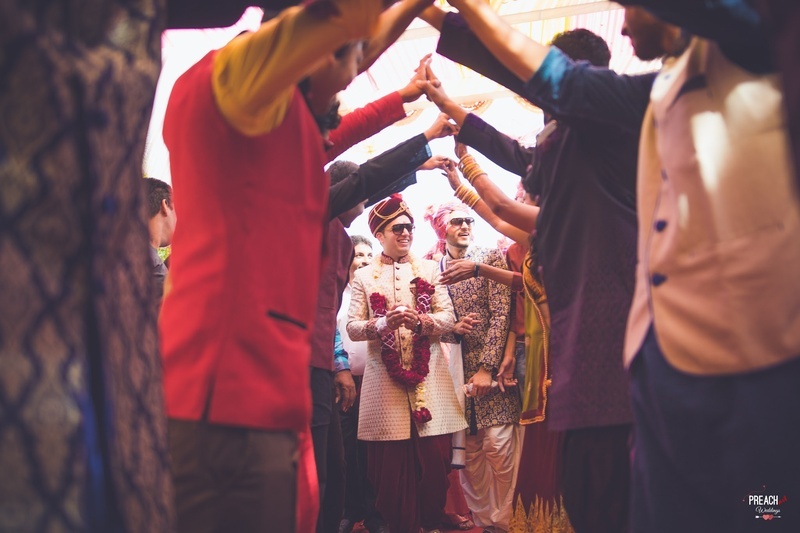 Bride and groom wearing color coordinated outfits for the wedding ceremony held at Mangalya Vatika, Sola Bhagwat, Ahmedabad. 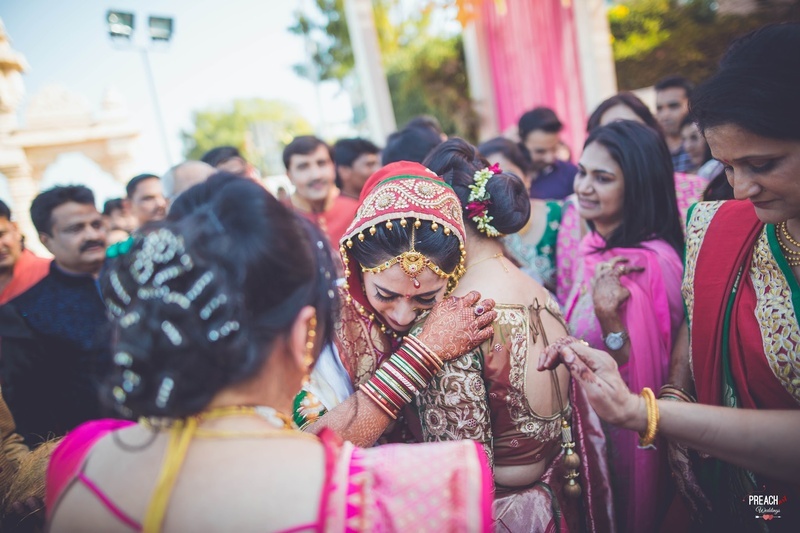 Vidaai ceremony with lots of emotional moments captured by Preach Art!